I'm sure that, once upon a time, a caveman painted exactly the number of animals he'd hunted that day on his cave wall, so this isn't really the original data visualisation. It's a good indication of where our current obsession with data visualisation is going though. Posters. On the walls of mostly stoned students. 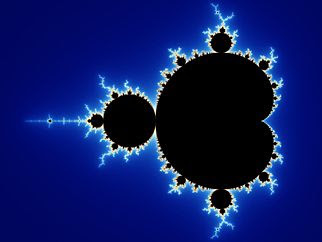 The Mandelbrot set may have uses, but the visualisation of it doesn't, unless you need something to stare at while you contemplate whether your munchies are enough motivation to get up and go to the fridge. Still excited about zoomable, rotateable 3D air traffic control?